We recently returned from Mobile World Congress, where many of our hardware partners showcased their latest devices and how Android is shaping the future of mobility. 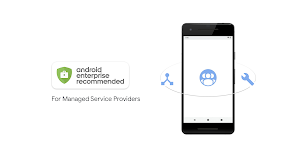 When we launched the Android Enterprise Recommended program, our goal was to provide the mobile ecosystem with powerful and versatile solutions, validated for enterprise use. The first validated knowledge-worker devices debuted just over a year ago, and since then the program has expanded to rugged devices, enterprise mobility management solutions and most recently, managed service providers. Today, we’re sharing highlights about how our partners are embracing Android Enterprise Recommended for how it provides choice, cost savings, and empowers companies to choose devices with confidence. SAP, a leader in enterprise application software, wanted to give its teams greater device choice and embrace the latest Android Enterprise management features. The company was looking for a solution to transition 9,000 corporate-owned devices onto modern Android Enterprise management for the separation of business and personal data delivered by the work profile. As part of this device strategy, the SAP IT team was also looking for a way to reduce the total cost of ownership with high-quality devices across various price points. Nokia has a diverse portfolio of Android Enterprise Recommended devices that range from high-end to more cost-efficient options. This gave SAP flexibility in choosing devices that met the same rigorous standards for the enterprise, regardless of cost. Part of the equation in lowering costs is time—SAP is transitioning to zero-touch enrollment for all Android Enterprise Recommended devices so the company can deploy corporate devices in bulk without any manual setup. Employees will get their device with the right apps and management settings already configured. When Yorkshire Building Society (YBS), a financial institution based in the UK, had numerous devices that were either unmanaged or running a legacy operating system and management solution, the company’s IT team was eager to modernize its management framework. After investigating both iOS and Android-based approaches, the YBS IT team migrated its mobile device infrastructure to Android Enterprise Recommended devices. The company made the Nokia 7 Plus its new corporate standard phone and developed a company app store to distribute applications through managed Google Play. These are just a couple of examples of what companies are doing with Android. We’re looking forward to hearing how more customers and partners are embracing the potential of Android.